Here are our trustees receiving the surprise cheque! We are hugely excited to share some news with you regarding our local project, Forget-Me-Notts. Since the beginning of this year, this project is now receiving regular funding from a generous local business, CP Walker & Son. 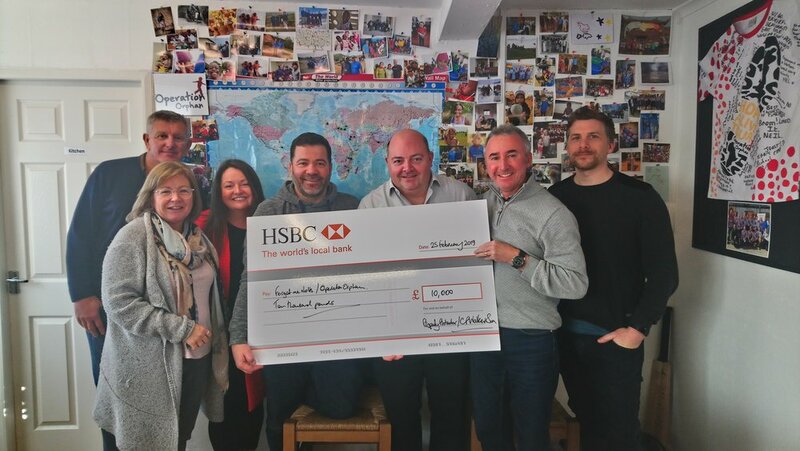 The business has committed to covering the running costs of the project long term, meaning the core team can now fully concentrate on engaging local people to help the vulnerable children and families here in the East Midlands. This week we received an unexpected gift of £10,000 from The Property Protector group, C P Walker & Son. Sean Neal was invited to our Trustee’s meeting on Saturday and arrived carrying a gold package. The trustees were so delighted with this gift and with Sean’s enthusiasm in helping in the charity. Together we celebrate the beginning of this exciting new partnership. Now that our East Midlands hub is running smoothly, together we are looking forward to expanding this project to help as many children in need as possible, both here in the East Midlands region and beyond. “As a Nottingham based business we are proud to offer our long term help to Forget-me-Notts. We are currently looking into the feasibility of opening up new Forget-Me-Notts hubs in other areas. We hope to be able to share more about this with you soon..
“Operation Orphan has a great dedicated team, all with the same huge heart and passion to help these vulnerable kids and families. You have a great following on Facebook and it's heart-warming to know that there are others out there with the same passion, and are equally full of generosity.” Sean Neal.